The end of the year is quickly approaching! I am super excited, aren’t you? Well, so are the students, and their behavior is showing their excitement. The children are full of energy and struggling to sit still. Some teachers are pulling their hair out trying to keep structure in their classrooms. Anyone else noticing this? With 18 more days of school left here, we have to tighten up the reigns on behavior, and find a way to stay positive. My job as an inclusion special education teacher turns into a behavior therapist around this time of every school year, so I wanted to share some ideas that can be implemented to help throughout the end of the year. 1. Fidgets – Give children an “approved” way to get their movement out. I don’t enjoy listening to tapping on the desk, but I am fine with them squeezing a stress ball or rubbing a Velcro strip on their desk. What can you handle? 2. Praise, Praise, Praise – This becomes more and more difficult to do, but you will feel better if you focus on the positive and praise those that are doing correct. Try to praise 4 kids for every 1 that you have to redirect. 3. Brain Breaks – Build in times to your schedule to allow children to get up and move. There are a lot of fun songs and dances online that can be done quickly in the classroom. The Just Dance ones on YouTube are my favorites. 4. Celebrate – Have a class reward ceremony to celebrate the great things about your students. Many times we get caught up in rewarding just for academics and attendance, but I challenge you to find a reward for every child in your classroom. The students can even vote on peers for different rewards. Who has the best sense of humor? Who is in the most inquisitive? Roll out the red carpet (butcher paper works great!) and celebrate! 5. Frequent Positive Reinforcement – Many children need more frequent positive reinforcement during this time of year. The end of the week Fun Friday use to be enough for some, but it may not be frequent enough now. Try to come up with ways to reinforce students even more frequently to keep them focused on the goals all the way to the end of the year. I could easily add more ideas, but these are my top 5. Focusing on these 5 have been very successful for me in getting through the final weeks in the past. It is definitely not an easy task, but it is something we must do. Don’t just fall into “survival mode”! Make the most of the rest of the school year, and you can have the best class all the way to the end. Have fun and good luck! Heather Salsman is a Special Education Inclusion Teacher from Indiana. 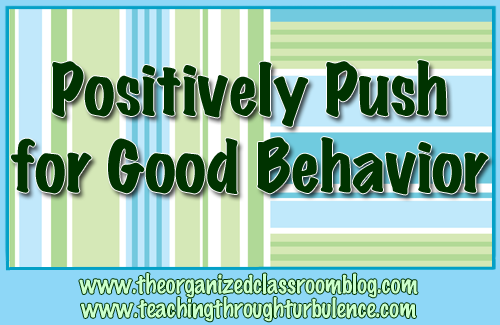 She blogs at Teaching Through Turbulence about behavior management and differentiation. Need some fresh ideas for traveling in the hallway with a quiet class? Check out this FREE Workshop “Helpful Hallway Transition Tips” and grab a downloadable cheat sheet to take with you too! Register HERE.